Grace Brethren Army chaplain CH (CPT) Pete Stone recently deployed to Afghanistan with the 101st Airborne Division. Recently, he sent some prayer requests. Here are a few from his letter, which has been edited to protect the mission of the men and women he serves. After several weeks of transit through several locations in Central Asia and Afghanistan, I have finally arrived at my home for the next 9 months–FOB Gardez. I have to admit I was not quite prepared for the gruelling nature of the transition–crossing timezones several times, sleeping in different places, dragging heavy ruck sacks and duffel bags around, waiting on the flight line for hours at a time for an aircraft that doesn’t arrive. All that to say, I arrived here at Gardez exhausted and sick. I was grateful to spend a few days with the chaplain I replaced here at Gardez to learn my way around and to become familiar with the chapel community here. I’m really grateful to have a worship team here that leads the music. However, when I travel, like Bob Dylan sang, all I’ve got is a red guitar, three chords and the truth. Hopefully my Soldiers will survive the guitar part when I carry it with me and try to lead worship with them. Thanks for your interest in what God is doing here. I’d like to share some specific requests now that I’m here and know more about what’s going on. mission success–I don’t want God to bless our mission because it’s an American mission. I want God to bless it because I fully believe it is a just mission. I pray earnestly for a peaceful Afghanistan where these majestic people can begin to lead a quiet, prosperous life, and the gospel has an opportunity to flourish. 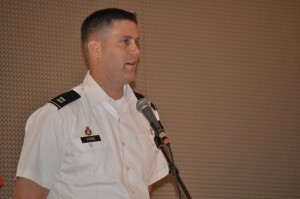 For more information about Grace Brethren military chaplains, see eaglecommission.org.